In brief: We don't get way downtown much but when we do, Adrienne's is hard to resist. Lunch time is packed with the local working crowd and the staff do much to facilitate the relentless flow of pizza tray after pizza tray. Pepperoni is the only way to go here. 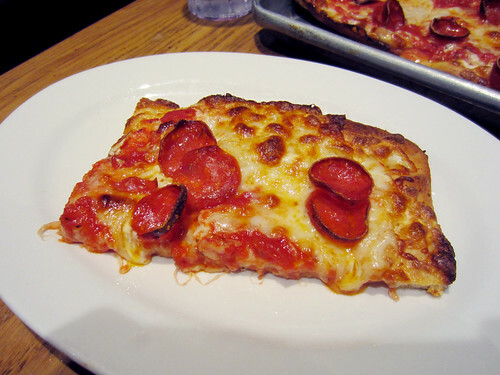 It's always plentiful and crisped on the edges the way pepperoni on pizza should be. They only have one size and that's a 10-slice tray of pizza, way too much for us but somehow just right for the two fellows sitting to my left. Through the first slice we didn't even speak, the overwhelming joy of a hot crusty, pepperoni laden slice had us in raptures.